I always love challenging cards where there are folds and different cuts to make, just fun to me. I also like to figure out how to do them from pictures! 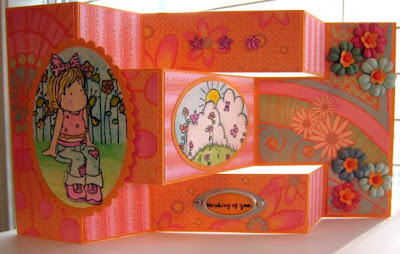 This is the tri-shutter card featured this week on Split Coast Stampers (SCS as I usually say). If you would like to try it yourself here is the link to the tutorial. The first one is my husband's birthday card, which was yesterday. I tried to make it masculine and since he doesn't really like fishing or hunting or any other outdoor activities it is hard to find a stamp to fit. So castle it is! I needed to stamp in the empty space above the castle so I used the French script stamp from Stampin' Up to fill it in. Since the stamp already had script it seemed to fit. I am really happy with how it turned out. The other one is one I started earlier this week and couldn't figure out what to do with the space on the right. I had everything else done but I didn't want to cover that pretty paper and the flowers on the paper that I painstakingly cut to fit that little "T" area. I sat down this morning and decided to finish it so I came up with the Prima flowers. I used the old in-color marigold morning paper to punch some flowers for the centers, got them real wet, wrinkled them up and then they worked with the Primas. Otherwise they looked odd in the middle of those flowers but I knew I had to bring in that color to make them fit in and match the card. 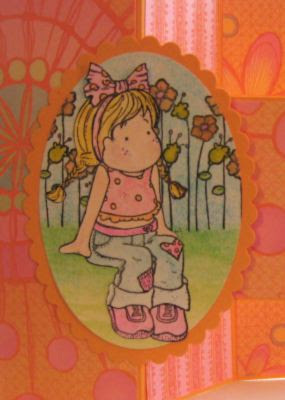 The stamp in the center with the clouds and flowers is also a Magnolia stamp as well as the flowers behind Tilda. I really like these colors and this paper! Hope you enjoyed these cards :) By the way if you click on the picture you can see it larger, then hit the back button to come back here. WOW!! What a card! That looks exhausting and very pretty :) Love all the pretty colors! 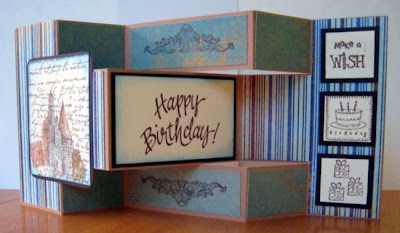 I can't believe you made two of these cards, but then you are Lori, and you are great at thsi stuff :) Both are beautiful. I don't know how you can top yourself. They are both so nice! I especially like the Tilda! Great job, Lori! Oh and (belated) Happy Birthday to your Hubby! Jacque thank you so much! Your cards are so awesome I appreciate your looking at my lil ol' cards! Rachel and Jan it really wasnt as hard as it looks! Thank you for the compliments! Thank you Cheryl, I love the paper so much on that one too! And thanks for the b-day wishes for hubby!